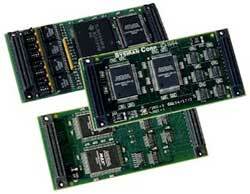 IPack modules are versatile mezzanine boards, roughly the size of a business card (1.8 x 3.9-in. singlewide), which reside on carriers. Each singlewide module can support up to 50 I/O points. They provide a good medium for implementing I/O solutions in simulation applications, with the flexibility to adapt to a broad range of I/O requirements and applications. I/O Solutions are general-purpose IP modules based on the IndustryPack Logic Interface specification. These interfaces enable designers to specify and implement solutions with a greater level of flexibility than traditional host-based I/O boards. The small form-factor, low power requirements and generic features make them powerful solutions for applications including simulation, data acquisition, instrumentation, and process control.